The Naturehike cloud is a rather interesting design of backpacking tent. As the words cloud and ultralight would suggest this particular design of camping tent is focused on being lightweight. The first thing I usually think when it comes to lightweight tents is cheap, however I was completely wrong about this one. I am so excited to finally do a review on a tent that comes with a limited lifetime manufacturers’ warranty. This warranty means you know you’re getting a good quality product because the manufacturers have backed it with confidence and nothing says confidence in a product more than a lifetime warranty. Have a look at how it faired against our Tentsforcouples grading review system. If you’re in the market for a new camping tent or you’ve had a previous tent fail on you then you are well aware that cheap means nasty and unreliable. In contrast, a camping tent of high quality should never cost more then $100US per person space. Now that we have covered that, I am pleased to say that this tent fits within these guidelines. This is the first camping tent I have done a review on which is made of nylon. My research shows that nylon has very similar strengths and weakness as polyester in contrast to canvas. It is great for being lightweight and if an added waterproof sealant is added with sealed seams will be rather waterproof. Which this particular model is, but more about that later. The denier level of this product is rather low. 20D suggests that the threads of nylon are rather small, though this can mean a weaker material I believe this was deliberately done to achieve a lightweight package. To counter any concerns of cheaply made materials the manufacturers’ covered all nylons with a silicon layer which achieves higher levels of water resistance while also creating tear resistance for the material. Secondly a smaller denier level can mean that the gaps between each thread are smaller and more tightly woven, which in combination with the silicon coating provides both a lightweight package which is also highly water resistance and also rip and tear resistance. Had the denier level been left at 20D without these added extras for durability and water resistance I would not recommend the product as it would penetrate and deteriorate very quickly. As mentioned in previous posts regarding polyester, nylon will also sag and weaken if exposed to extended periods of sunlight and heat. It is always recommended setting up a tent where it will be covered by shade during the most intense hours of sunlight. It is worth highlighting however that the Naturehike 3 season ultralight Backpacking tent does not have a UV protection layer added onto the fly sheet. Added UV protection coatings provide both the tent and occupant from harmful UV rays and should also assist with reducing sun damage or fading to tent. However, to be fair, this tent is designed for backpacking and hiking and so the occupant is presumably traveling on foot during the day and setting up camp in to evening, thus extra protection from sun damage isn’t really necessary. If you are more interested in setting up camp and exploring on foot whilst leaving the tent erect all day then I would advise setting up the tent in shade as previously mentioned. The Ground sheet of the tent is also made of the same material with the same level of strengths and weaknesses. This is rather strange as the thickness level of the tents groundsheet are usually thicker to prevent sharp objects from penetrating through. Usually I would advise to purchase a separate ground sheet setting the tent upon to prevent such damage but the manufacturers’ have been considerate enough to supply you with one for free with the correct dimensions. I’m rather pleased that this was included as it shows that the designers know what is essential for a good tent and I am positive that the groundsheet is only thin due to the focus and feature of the tent being lightweight and designed more for hiking and maneuverability. Straight away knowing that this products design is mainly focused on being lightweight you can presume it does not come with all the bells and whistles a glamper desires. But then again if you’re outside enjoying your adventures why would you want all of those extra features anyway. That being said the tent does come with a few nifty features worth mentioning. Firstly the tent has raised sewn seams. This is often referred to as a bathtub design as the raised seams make it very difficult for external puddles of water to enter the tent. While the tent does not come with a vestibule it does come with a rain fly. While rain flies usually offer extra protection over the inner tent layer this tent design has done something a little different. The inner upper levels of the inner tent is completely exposed as fly mesh. Essentially this offers a combination of maximum water and wind protection but also offers protection from pests whilst offering added ventilation . This added ventilation is fantastic when you consider that the tent only has one doorway and has no windows or added vents. While the design has covered most points of consideration for the lack of door, windows and vents it fails to provide an emergency exit which leaves the occupant to rely heavily on the main entrance never failing to open in an emergency situation. 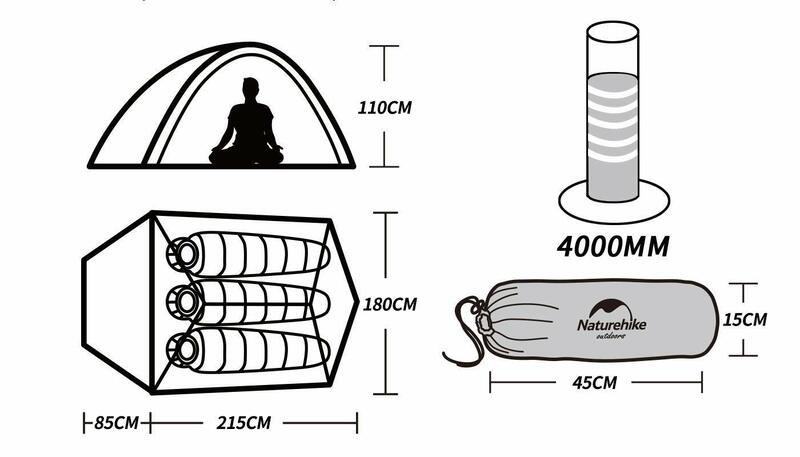 To finish on a positive note this lightweight minimalist designed tent does come with internal pockets and doorway fasteners which can allow you to store personal items or internal lights and also have your doorway open or closed and out of the way depending on your desired level of required protection. You could be forgiven for presuming that the words ultralight and cloud suggest a lack of durability. In the case of the Naturehike 3 person Cloud-Up you would be wrong. In the context of durable, this tent almost scored full points which even surprised myself. When you have a closer look at the features it is easy to see why is scored so well. To start things off lets look at the foundation, or in the context of camping tents, the frame work. The frames are made of 7001 graded (strong) aluminum compete with shock cord and reinforced tips. In term of tent poles they don’t get much better than that. Aluminum is fantastic for maintaining strength through flexibility and unlike fiberglass or plastic poles doesn’t have a risk of chipping or splintering under pressure. Shock cord on the inside of the poles adds flexibility and support for the frame whilst doubling as a method to keep your poles together during the pack up/set up stages. Though not really necessary on metallic poles reinforced end assist poles with extra strength around high stress areas such as connection points whilst under constant stress during the flexing stages. Due to the semi dome like design of the tent, Naturehike have steered away from traditional grommets, connecting the frame to materials. The have gone for a reinforced method which involves separate tethers of material attaching to the tent frame and to material. This type of design is fantastic for reducing stress levels on the frame work and material whilst allowing for increased wind stability, but we will cover more on that later. Stitching on a tent can be the difference between durable, reliable and unreliable single use. 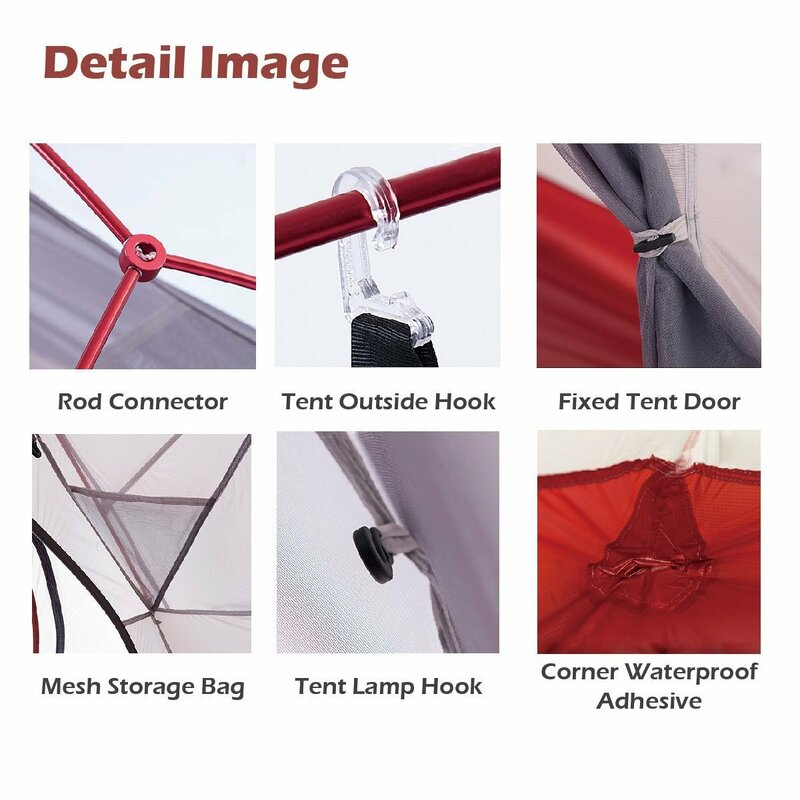 This particular tent uses a quality high strength seam design which is then double sewn into place, adding strength to this is the added water sealant tape on the seams, which will be discussed further in the water resistance section. Earlier in this post we spoke of the limitation a single doorway tent can have I term of emergency exits and the risk of zipper failure. I do believe the designers of this tent have made considerations for this in areas. The zips are of a high quality nylon coil design with what appears to be a rust proof zip. The zip lines are also covered with a protective cover on the outside to protect the zips from moisture dirt and frost. This is very important in term of maintaining full functional zips. The zips are also of a dual design with added material pulls. What this achieves is a reduced stress load upon the zips whilst also allowing for quick and efficient zipping. In the context of requiring to exit the tent in an emergency these systems put into place should ease your mind of any zipper failures occurring. Of course, it is also important that you take care of the zippers yourself by maintaining them clean and free of dust and dirt. A tent with a three person space is on the smaller end of what I prefer to recommend to customers. However, in the context of light weigh traveling and exploring with your partner this tent offers the essential space for two sleeping bags and a little extra room for you backpacks etc. According to the sizes provide this particular tent will provide you and your partner with just enough sitting head room whilst also providing that warm snugly feeling during those cold night or if you are forced inside due to bad weather. Though I am sure you will notice what looks to be a vestibule on the main entrance of the tent, I assure you it is not. These are essentially wind block to allow for ventilation whilst protecting the main entrance from side gusts, which is always nice however I feel it is a wasted opportunity to provide dry external storage which would have been a really great feature for this tent. Check our this quick review demonstrating the size. With what we have cover thus far, it is no surprise that the Naturehike Cloud-Up Tent scored full marks in consideration of manoevrability. The overall package weighs less than 3kg. Considering this weight includes the alloy poles and pegs it is evident that the design of the tent is well-thought-out. Having such a small total weight which can be carried upon your backpack means you can explore hands free and not carry around a large sack on your back. Secondly having such manoevrability means the total tent package does not have any limitations in term of transport, it can be used hiking, backpacking, camping and transported via either bike or other forms of vehicle. Lastly is a point of safety. Being such a lightweight package that allows for both hands to be free essentially prevents unnecessary injury which could occur during hiking rough terrain or carrying a large heavy awkward load. Season rating give customer a quick guide as to what temperatures they can expect their tent to handle. 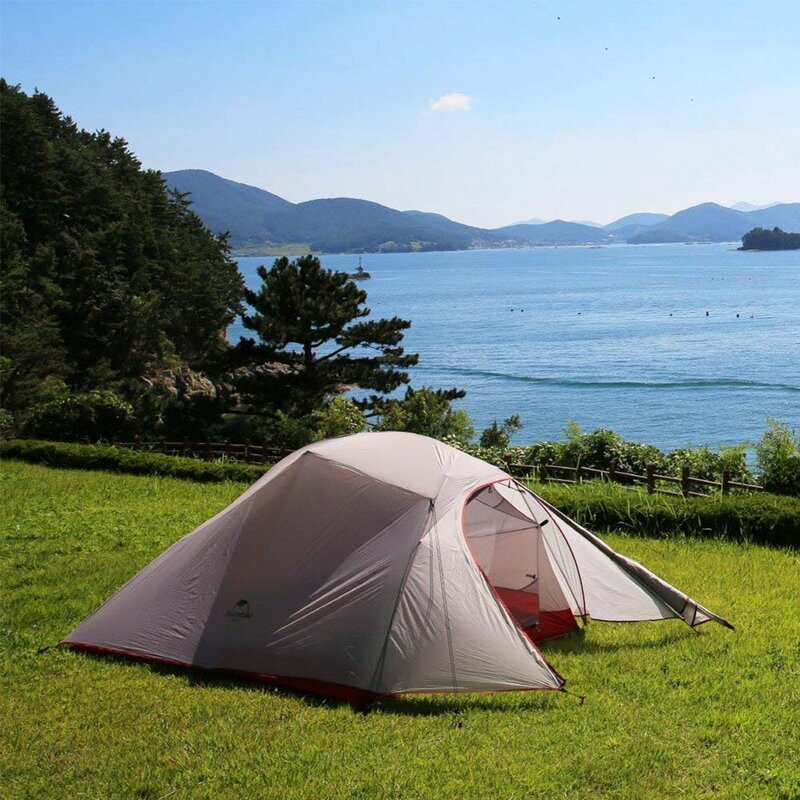 A four season tent rating simply suggests that the tent is appropriate for all season. This particular tent comes with such a rating. However, what is often forgotten or not mentioned is that a 4 season tent rating doesn’t cover all 4 season across the globe. There is also something called a temperature comfort level. A four season tent, unless specifically designed with added layers and insulation is not appropriate for temperatures exceeding far below 0C degrees. For Temperatures of -5c Degrees it is recommended to get a specific winter designed tent which specifies how low of a temperature the tent can handle. These tents may eve come with a built in wood oven. Getting back to the tent in review I am confident it can handle temperatures ranging from -5c degrees up 35c degrees. That being said I would make certain actions of consideration. If the temperatures are pushing towards the lower end, it is essential that yo also dress appropriately and also purchase yourself a high quality sleeping bag which can handle the lower temperatures. Secondly for the higher ends of the temperature scale I would maximize ventilation and also set up the tent in shade during to day, and of course dress appropriately for warmer weather. Basically what I am saying is that this tent will handle anything a normal season of weather can throw at it but for big extremes either make special considerations or purchase a tent designed for such extremes. Being made of aluminum and nylon and also having the name cloud and ultra light in the brand name, you would think the tent performs poorly with wind resistance. Again you and I would be incorrect. Though nylon or polyester material can flap about due to being lighter then canvas, the design of the framing structure plays a huge roll. What you will notice in the photos provided is that everything is designed to be under secure constant tension. The alloy frame is under constant flex while it also pulls up the inner tent along the tethered reinforced grommets. secondly the entire inner structure is secured and further held down by the exterior rain fly. Thirdly both the inner base and exterior rain fly are held down with tent pegs and guy lines. Finally, as mentioned earlier the front door features wind blocks. All of this adds up to one very lightweight but very secure hiking tent. Alright lets get straight to the point. It is waterproof. There are a number of features helping this tent maintain such a high score for water resistance. First feature to mention is the material. Nylon itself is already rather water resistant however to added silicone layer applied to the material boosts the hydro static head level up to 4000mm which is more then enough to keep you dry in poor weather. Secondly allot the tents seams are sealed with waterproof seam tape. Though not allot of water would get through these seams with the help of the outer second layer, the sealed seams prevent any moisture entering the tent through the seams which could cause humidity build up and eventually develop into puddles. It is also important to mention that if your seams are not waterproof sealed then small amounts of moisture could build up in the seams stitching slowly rotting them away and rendering them weak and useless. Thirdly the tents bottom sheet has the seals sewn up higher which will prevent any exterior pooling or running water from entering. finally, the wind breaks on the exterior rain fly can act as a protection from light showers providing added ventilation inside the tent should you wish to have the doors open, but this feature is heavily dependent on the wind and rain directions. The only downside is that the tent doesn’t come with any waterproof sealant spare in a bottle, which some tents do come with should you wish to apply more. To be fair though it is argued that sealed seam tape is better than the sealant itself and if you did want to add some extra waterproofing products to your tent like seam sealant or eve an exterior coat it can be purchased separately rather easily. Finally a camping tent that is backed with confidence. All Naturehike products come with a limited lifetime manufacturers’ warranty. What this means for the Naturehike Cloud-Up Ultralight is that anything outside of miss use is pretty much covered. Obviously no company is going to offer a complete lifetime warranty simply because there are folks our there who don’t know how to look after a tent or simply misuse it. If there is any doubt that this is a quality product or perhaps you aren’t sure on how to look after your tent check our these customers comments and then head on over to our ‘How to Keep Your Tent’ guide. While setting up time for this tent may not be as quick as an instant or pop up tent the still scored rather high for set up speed and what is surprising about this is that it is a two layer tent. Customer feedback suggested that the tent will take approximately 6 minutes setting up. This of course is with two people. A single person set up would of course take longer. Whether it is one or two people setting up the tent manufacturers have stated that the tent is fast and easy setting up for beginners. To support this claim is a video below displaying just how simple and quick setting up truly is. I would only recommend this tent to couples who are truly our and about hiking and backpacking who need something lightweight and somewhat minimal. If this sounds like you then yes I most certainly recommend you purchase this tent and I am confident you will not be disappointed. However you want something with a few more bells and whistles and the cost of added carrying weight then I would recommend this Triwonder Tent instead click to see the review. This Naturehike tent did very well in our grading system. To be honest my first opinion was that this tent was going to score poorly due to how lightweight it is but I must admit I was wrong. 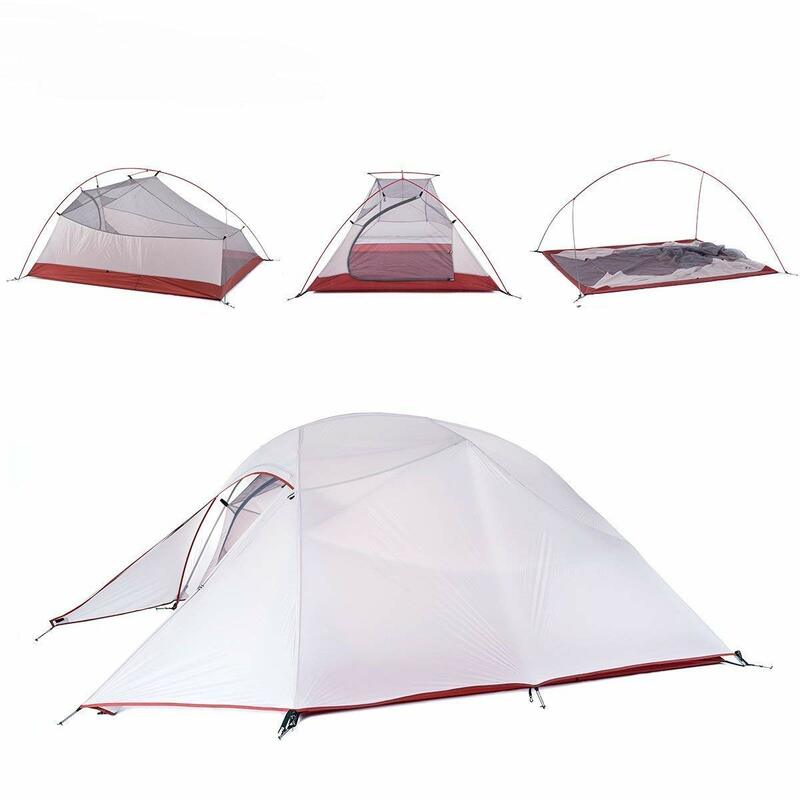 The tent got perfects scores for price, warranty and monevrability. however, because of the focus being a reliable lightweight durable and reliable tent, which is scored well on, it scored rather only above average on size, features and material. To be fair though the material only scored low because it is nylon and the silicone coating that adds both strength and water resistance is rated under durability and water resistance and not the material variable. The main downside to this tent is the single door, no, windows or blackout design and lacked added vents and emergency exits. however, ventilation is still high due to most of the inner tent being fly mesh protected by the outer tents rain fly. Secondly the lack doors or emergency exit is somewhat rectified by the manufacturers’ by adding extra reliability and durability to the zips and seals themselves to reduce the risk of zipper fail in an emergency. To finish off strongly I would like to highlight just how impressive the semi dome design truly is. Though lightweight everything on this tent is designed to ensure a strong durable performance. From the frame and grommets to the material and guy lines. To top it all off the tent comes with a limited manufacturers’ lifetime warranty, which is absolutely fantastic considering other tents come with rather limited warranties or even worse no warranty at all. Let me know your thoughts on this review. Know of anything I’ve missed? disagree with anything in the review? I encourage operand honest discussion in the comments section below. I would love to hear from you. In a month I am going camping in Colorado. Do you think this would be a good fit for my 3 friends and me? Would we have enough space? Very detailed review on NatureHike Cloud Up Ultralight backpacking tent! I’ve never used a tent before, but I do see the other hikers use them on longer hikes. When it comes to hiking, I’m always looking for weight reduction and this tent seems to fit those criteria. Pleasure Eric. Let me know if i can help you any further. Dang man, very thorough review for sure. I actually just got back from camping for 2 days. Used a 10 man tent and realized it was way more then what we needed. Looks like this would have been a better choice.